APD Dumfries finally completed a home league match with a heavy nine wicket defeat of SMRH in the Scottish Championship on Saturday. The Edinburgh side could only muster a total of forty one after opening bowlers Allan Maskrey and Robert McBride cut through the batting line-up with four wickets each. Drew Dawson then took the Nunholm side to an easy win with twenty six not out. Captain Corbett-Byers observed “I was lucky enough to win the toss and normally at Nunholm you’d have no hesitation in batting, but the wicket was a bit sticky and I decided to put them in. Our opening bowlers simply put the ball on a good line and length and we held our catches well.” Six catches were taken behind the wicket with Beveridge snaffling three of them. 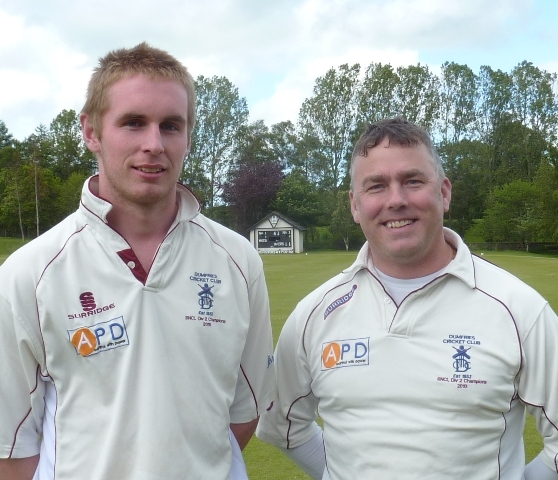 The previous evening Dumfries has registered another nine wicket win at Selkirk in the Murgitroyd Twenty/20 Cup. There it was young opening bowler Niall Alexander that took four wickets. Stuart Corbett-Byers and Chad Breetzke were not out on 32 and 29 at the finish. However after dismissing their league opponents for forty one on Saturday Dumfries understood that experience the following day at Nunholm. The side suffered from a poor batting performance against Renfrew in the Scottish Cup which saw them collapse to forty seven all out and an inevitable defeat in a game which Renfrew won by nine wickets. This Saturday APD Dumfries are away at Penicuik in the Scottish Championship League and, after a cancelled match last Saturday, the seconds, Site Electrical Nunholm are at home against Shawholm in the West SNCL Reserve League and the Sunday XI play at Prestwick.